This is probably really ridiculous to legit coffee snobs lovers. I love it though. I was introduced to it at a young age and we met again a few months ago when I was trying to convince Colt I needed a Keurig. Needed. After weighing the pros and cons and money it takes to keep buying those little cups, we decided not to purchase one. 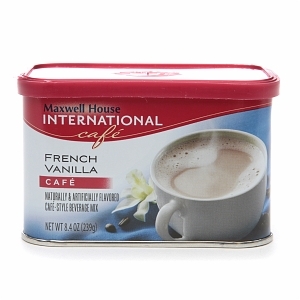 Because it was more Colt's decision than mine, I told him that in place of the Keurig, I would need to have a constant supply of French Vanilla International Cafe coffee mix. He agreed to it. One of my most favorite parts of the day is sipping on my fake coffee drink. Take a break from being totally cool and try it!